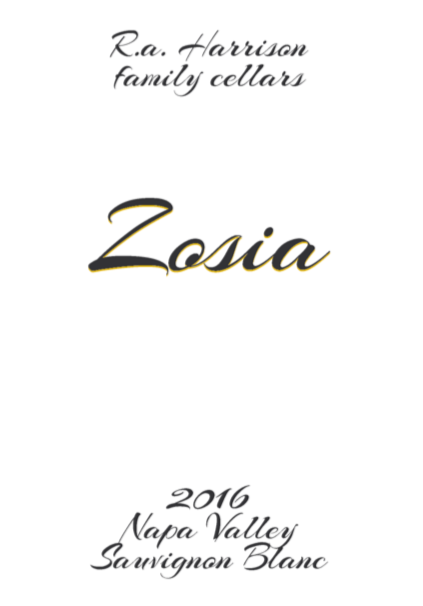 Winemaker's Notes: The 2016 Zosia Napa Valley Sauvignon Blanc comes from a single vineyard in the Northeastern corner of Carneros Napa Valley. Harvested early October 2016 at 24 brix, the wine was fermented very slowly in 100% stainless steel at 55 degrees. It was fermented in stainless steel for 3 months before being moved to neutral oak barrels and aged for 2 months to enhance the mouthfeel on the mid-palate. 125 cases produced. Tasting Notes: Explosive aromas of mango, papaya, and cantaloupe. Hints of citrus segments, waterfall spray, and subtle notes of fresh herbs. On the palate, mouthwatering acidity washes over the tropical fruit in spectacular fashion, creating a balance of flavor and texture. This wine is the perfect spring picnic or poolside accompaniment.